Eliminates restrictions, dramatically increasing the cooling capacity for massive continuous power. Big aluminum end tanks won't burst like stock, with a thicker core for a 21% improvement in volume. Includes mandrel-bent 3.5 inch high-flow boost tubes and super-flow High-Ram intake manifold for maximum performance. 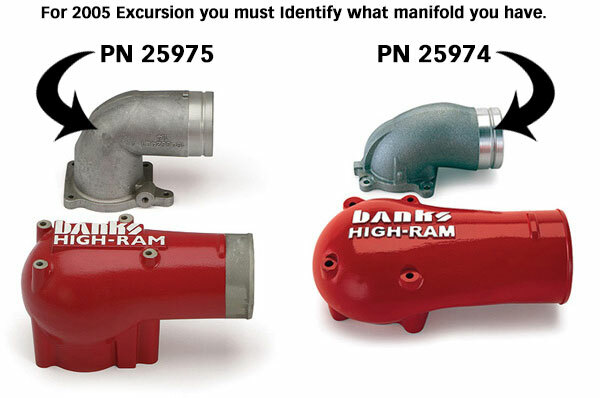 Please note: 2005 Excursion owners must identify which manifold they have. 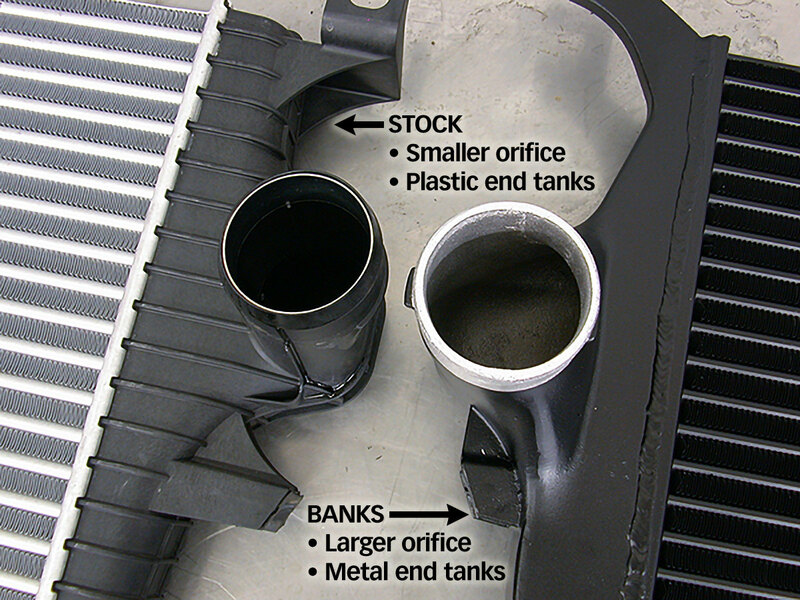 Superior to stock, everything about Banks Techni-Cooler Intercooler system is bigger. It includes mandrel-bent 3.5" high-flow boost tubes... large high-efficiency all-aluminum end tanks instead of the wimpy stock plastic ones that can rupture under high-boost conditions... a wide-open inlet and outlet... a 19% thicker core area with a 21% improvement in volume ... and a colossal super-flow High-Ram intake manifold . Techni-Cooler dramatically increases the cooling capacity by balancing the richer fuel mixture with greater airflow and cooler, denser air. Denser air has more oxygen, which improves combustion as well as engine efficiency. Result: higher continuous power and more power at any exhaust gas temp (EGT), better fuel economy and lower EGTs. That's a truckload of benefits! Banks Techni-Cooler delivers the maximum reduction in boost air temperature with a minimal loss of boost pressure. It doesn't get any cooler than Techni-Cooler! Mounting hardware included.